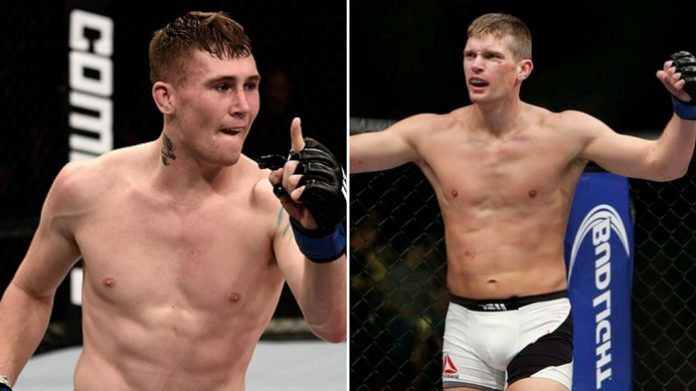 “Wonderboy” vs. Darren Till: A Case of Too Much, Too Soon for Till? At UFC Fight Night 130, the platform is set for England’s brightest prospect, Darren Till, to elevate himself into title contention in the promotion’s welterweight division. The man tasked with stopping the Liverpudlian on May 27. is Stephen “Wonderboy” Thompson, one of the absolute standouts at 170-pounds. For Till, the event represents a golden opportunity of sorts. The UFC will host their first event ever in the 25-year-old’s hometown. The event had initially been penned in as a UFC Dublin event, before being announced in Liverpool. With an entire country behind him, there is a real sense of excitement for fans of the welterweight rising-star. This is no better-evidenced than the BBC – Britain’s national broadcaster -choosing the fight as the first to ever be broadcast on the network. UFC President Dana White knows that the promotion has, in Darren Till, a potential goldmine. This is a British fighter with a fanbase which could light up the UFC, in the absence of its Irish superstar Conor McGregor. While the old days of fans from the Emerald Isle colorfully ‘taking over’ Las Vegas in their droves to support their hero are history (at least, for now), the English will have more reason to replicate their neighbors’ support of McGregor. Given Michael Bisping’s approaching retirement, the UFC will not be rejecting an opportunity to develop another English star. There are many ‘firsts’ in this fight for Till. This will be the first time he has arguably faced a top-class, genuine welterweight in the UFC. While the reason “The Gorilla” has ascended to this position was off the back of a stunning win over promotion legend Donald Cerrone, “Cowboy” is undoubtedly a natural lightweight. Cerrone’s pedigree at 170 was nowhere near as formidable as Thompson’s is. This will also be the first time Till has dealt with the threat of a UFC welterweight contender. Thompson’s two title fights against current champion Tyron Woodley culminated in a majority draw, and a majority loss, respectively. These bouts could have gone either way and will have undoubtedly benefited “Wonderboy” in the long run. What they demonstrated to fans is that Thompson is a bona fide contender and arguably the closest candidate for the title behind Woodley. This fight is widely regarded as a genuine title eliminator bout. Whether it will determine the next opponent for Woodley or the winner of the interim-welterweight title fight between Rafael dos Anjos vs. Colby Covington is by the wayside, for now. As Thompson has already fought Woodley twice in 2017, there will likely be permutations at play: a win for Till could possibly lead to a title fight with Woodley, while a win for Thompson may seem him fight for the interim title. There is no doubt that Stephen Thompson carries more experience and a much better record into this fight. When comparing both fighters’ records, the American’s tag as the favorite for the bout is easy to justify. In 12 fights over six years in the UFC, Thompson has a record of 9 wins, 2 losses, and 1 draw. “Wonderboy” holds victories over a current champion (middleweight champ Robert Whittaker), former welterweight champion (Johnny Hendricks), and contenders such as Rory MacDonald and Jorge Masvidal. Factor in two bouts against incumbent 170-pound kingpin Tyron Woodley and his record really looks serious. Till, aside from his victory over Donald Cerrone in Gdansk, Poland in 2017, cannot boast anywhere near that record. Two unanimous decision victories over Bojan Veličković and Jessin Ayari, respectively, followed a draw against Nicolas Dalby. While Till got off to a flying start in his UFC record with a win over Wendell de Oliveira, he only really came to prominence with his blitzing over “Cowboy”. Comparing both fighters’ records should not really warrant a genuine match, but hey, this is MMA in 2018. That is not to say that Till will be greatly outmatched, however. Darren Till has a lot going for him, coming into this fight. A big and powerful 170-pounder with an excellent Muay Thai background, Till could pose a hell of a lot of problems to Thompson. His clinch game – coming from a traditional Muay Thai background – is excellent. He undoubtedly has power and a sweet and precise left hand, which we saw demonstrated to its fullest capacity against Cerrone and Jessin Ayari. The problem for Till will be finding a way to work his way inside Thompson, and past his exceptional kicking game, with which he used to catch the attention of fans in the early days of his career in the UFC. With Thompson, one of his biggest criticisms was his style of keeping his hands down. As we saw against opponents such as Tyron Woodley and Robert Whittaker, however, is that there is a method to this madness. “Wonderboy” is an elusive fighter who can bob, weave and sidestep his opponents’ shots, taking the occasional blow – but he has a very underrated chin. His step back straight-left counter, or strikes in retreat are also a key part in his arsenal of weaponry. His lateral movement and excellence in finding angles cannot be discounted, and these are likely to be areas which could frustrate the Liverpudlian. Where the danger will come from Till, most likely, is if he can capitalize on Thompson’s habit of throwing predictable straight punches, especially with little to no head movement. Another area the Englishman could find some success against the rangier Thompson is by employing shorter steps and feints, and by dishing out a healthy share of low kicks to minimize Thompson’s movement. Although an excellent kicker, Thompson does tend to expose himself sometimes when throwing predictable sidekicks. In his first bout with Woodley, this did seem to be rectified, but such carelessness a fighter with a sharp left-hand, and an excellent clinch game like Till, it could be a costly mistake. With Thompson’s experience – especially in 5-round bouts – he has a discernible advantage over Till. The pressure will certainly be on the Englishman, given the occasion of fighting in front of a home crowd. If he can find a way to beat “Wonderboy” then we will have a very interesting twist in the thickening plot of the UFC’s welterweight division.